The UVMFR-7 provides spectral irradiance data with stability equal to that of spectroradiometers but at a fraction of the cost. In addition, unlike most global spectroradiometers that only provide total horizontal irradiance, the UVMFR-7 makes diffuse, and direct normal measurements. Direct beam spectral irradiance data provides optical depth information that can be used to track the absolute calibration stability of the instrument. Most UV-B field spectroradiometers for making narrowband irradiance measurements demand constant attention by highly skilled personnel. The UVMFR-7 is designed to operate automatically and autonomously in remote locations with only periodic manual cleaning of the fore optic. A unique optical design coupled with the flexible and powerful YESDAS-2 data acquisition and control system, gives the instrument high performance at a modest price. The UVMFR-7 consists of two basic components: a Detector Assembly and an Electronics Enclosure. The Detector Assembly consists of the UVMFR-7 sensor head and the stepper-motor-driven rotating shadowband, which are mounted on a common base. An electronics enclosure, mounted below the Detector Assembly, contains a YESDAS-2 microprocessor-driven data acquisition and control system with 13-bit A/D conversion accuracy and the capability of collecting data from an additional 24 analog and 6 pulse/counting-type met sensors. The UVMFR-7 uses an automated rotating shadowband to make measurements of the global and diffuse components of solar irradiance. Once these two components are known, a CPU can readily compute the direct-normal component. 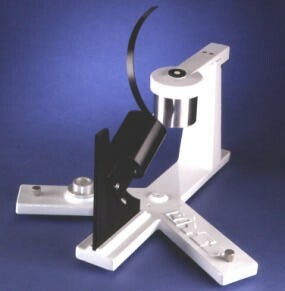 The geometry of the rotating shadowband instrument is shown in the figure below. The shadowband is a strip of metal formed into a circular arc and mounted along a celestial meridian with the instrument's entrance aperture at the center of the arc. The shadowband blocks a strip of sky with a 3.3° umbral angle, sufficient to block the sun. It can be positioned with an accuracy of 0.4° by the microprocessor-controlled stepper motor. The motor housing is adjusted for the latitude of the instrument. When the instrument is installed at the field site, it must be azimuthally aligned to the Earth's pole (North or South, depending on the hemisphere). Once aligned, no further mechanical adjustment is necessary and the instrument may operate for extended periods without any operator intervention, unlike trackers that require nearly constant attention. The operation of the instrument is controlled by its microprocessor. At each measurement interval, the microprocessor computes the solar position using an approximation for the solar ephemeris. The first measurement is made with the band rotated to its nadir position (global or total horizontal irradiance). The band is then rotated to make three more measurements. One measurement is made with the sun completely blocked (diffuse horizontal irradiance) and the other two are made with the band rotated to 9° on either side of the sun. The side measurements permit a correction for the "excess sky" that is blocked by the shadowband when the sun-blocking measurement is made. The microprocessor then subtracts the corrected diffuse component value from the global irradiance to obtain the direct-horizontal component. Finally, division of the direct- horizontal component value by the cosine of the solar zenith angle (available from the ephemeris calculation) results in the value of the direct-normal component. The entire sequence is completed in less than 20 seconds and can be programmed to occur up to 3 times per minute. The use of the computed solar ephemeris in the UVMFR-7 instrument gives it a significant advantage over instruments that use a continuously moving shadowband to make the global and diffuse measurements.The UVMFR-7 method permits much longer integration time for each measurement because it requires measurements at only four shadowband positions rather than making many measurements during a continuous scan across the sky. Longer integration time substantially improves measurement precision and permits operation at wavelengths and passbands that would not be possible with a continuously moving shadowband. The excess sky blockage correction significantly improves measurement accuracy, particularly under skies with fractional cloud cover. The filter wavelengths were carefully chosen by the atmospheric research community to maximize the utility of the data. For example, the 311.5 nm filter was chosen to land on a small but somewhat "flat" area of the spectrum, and the 332.4 nm was selected as a Dobson reference. Each filter-detector channel is individually characterized, yielding spectral irradiance in W/m2-nm. The UVMFR-7's unique ability to make simultaneous spectral measurements of the three solar irradiance components makes it an extremely versatile instrument. For example, in order to obtain the data collected at least two instruments would have to be used: a global filter radiometer, and either a tracker-mounted normal incidence sun photometer or a second, shaded global radiometer. When making spectral measurements, the UVMFR-7 has the advantage of sensing the global and diffuse irradiance components with the same detector.This eliminates the error introduced into the measurement of solar irradiance components by the use of different detectors to measure the different components, reducing concerns about the intercalibration of multiple sensors. The UVMFR-7 is simpler, less expensive and more robust. Finally, the UVMFR-7 instrument ensures that the measurements of the irradiance components are synchronous in time. Changing ambient temperatures can cause unwanted response changes in semiconductor detectors, resulting in measurement errors. To avoid these errors the instrument utilizes a computer-controlled thermal regulation circuit that maintains the detectors and filters above ambient temperature, thereby preventing thermal transients from affecting the solid state detectors. A side benefit is that the additional thermal energy helps to keep the sensor free of dew, ice, and snow. A separate thermistor permits the user to monitor the temperature. The solid state photodiodes, interference filters, and sensitive electronic components are all held inside a desiccated enclosure, further eliminating environmentally-induced measurement errors. The UVMFR-7 instrument operation and data logging are controlled by a microprocessor. This on-board CPU, 1) performs the required ephemeris calculations, 2) controls the stepper motor which positions the shadowband, 3) controls the acquisition, processing and storage of sensor data for the MFR-7 and up to 24 additional analog meteorological sensors,and 4) permits simultaneous data telemetry.The ultra-stable system time-keeping (with an accuracy of 1 second per month) ensures that the positioning of the shadowband will be precise over extended time periods, with no need for operator intervention or adjustment. The system data logger includes a state-of-the-art 13 bit self-calibrating analog-to-digital converter and on-board data storage capability of up to 2 Mbytes via the PCMCIA-2 memory option (most users want more memory to permit higher time-resolution sampling.) You can communicate directly through the 3m serial cable provided, or over a telephone lines using a user-supplied modem. Using YESDAS Manager software, data are automatically downloaded, corrected, calibrated and presented to the web. Modem communication allows a remote instrument to be controlled from a laboratory or office without interrupting its data acquisition, making it ideal for large, geographically widespread networks. Each UVMFR-7 instrument is individually tested and characterized before shipment. First, the response to a direct beam at different angles is measured in our cosine facility, where an instrument-specific cosine correction file is generated. Next, each head is spectrally scanned with a narrowband spectrometer to determine the precise full width at half-maximum (FWHM) bandwidth and center wavelength. Finally, each head is calibrated against a NIST-traceable FEL lamp to determine its absolute response. The interference filters and photodiodes used in the UVMFR-7 are of the highest quality and result in an instrument with exceptional ruggedness, long term stability of calibration, and excellent unit-to-unit repeatability of response. The spectral response of each wavelength channel of the UVMFR-7 instrument is measured using an Acton Research AM-511 one meter monochrometer. The unique spectral irradiance voltage transfer function calibration data provided by the FEL lamp is convolved (in conjunction with each channel's individually measured relative spectral response) to calculate each channel′s spectral irradiance in W/m2-nm units, as well as identify effective bandwidth and effective center wavelength. By doing this, unlike the integrated dose output from broadband UV-B instruments, the UVMFR-7′s spectral irradiance output data is readily comparable to spectroradiometer data. The ability to measure direct and diffuse spectral irradiance allows the user to conduct automated Langley analysis with the software tools provided. As in the visible wavelength MFR instrument, the automated Langley analysis results can be used to track the UVMFR-7′s absolute calibration, since the direct-to-diffuse ratio is independent of the UVMFR′s absolute calibration. As filter solarization gradually occurs under normal exposure, these shifts can be monitored and accounted for. Using the same method, the calibration of other more sophisticated UV-B instruments (such as spectroradiometers) can be checked against the UVMFR-7's direct-to-diffuse ratios. The UVMFR-7 belongs to a class of instruments that measure flux incident on a horizontal surface from a moving light source. Ideally, one would like these instruments to be uniformly sensitive to incident radiation coming from any direction. The response of such instruments to radiation incident at an angle, θ , with respect to the surface normal is called the cosine response. The ideal cosine response is proportional to the cosine of the angle θ , and any deviation from this response introduces measurement errors. The UVMFR-7 uses a novel diffuser input optic that provides superb cosine response and long-term stability. The radiation receiver element is a computer-designed, specially shaped Teflon diffuser disk that is directly coupled to an optical integrating cavity. Teflon is a halocarbon with excellent resistance to chemical and ultraviolet degradation, thus ensuring calibration stability in the field. In addition, instruments with diffusing input optics are inherently less sensitive to surface soiling than are instruments with transmission windows such as domes. The cosine response of each UVMFR-7 is fully characterized in our angular test facility. Each instrument is placed on a computer- controlled rotary actuator and the instrument's relative response as a function of its angle measured using a feedback-stabilized, parallel, uniform light beam. The individually characterized cosine response, supplied with each instrument, is used by system software to correct, in real time, for deviations from the ideal cosine response. quantity closely related to the extinction coefficient used in visibility studies. An automatic angular correction procedure corrects raw data for cosine errors based on the factory-measured, instrument-specific angular response. Next, factory-determined spectral irradiance calibration constants are applied to the data to derive engineering units. The software also performs automated Langley analysis on the data for retrieval of optical depth information. Once calibration constants are applied to the data via the host software, spectral irradiance data can be used for studies such as determining scattering due to aerosols. Aerosols have recently been shown to have a great effect on UV-B radiation at the earth′s surface, possibly impacting total irradiance as much as cloud conditions do. The direct-normal UVMFR-7 data can be used to measure both ozone and aerosols. In addition, by using the automated Langley analysis software (provided with the system) a self-check on the absolute calibration can be performed based on the stability of the extraterrestrial solar constant and the known optical depth. UVMFR-7 instruments are controlled by an included YESDAS-2 data acquisition and control system that controls the shadowband and thermal subsystems, stores and telemeters the data. Data are angle-corrected, calibrated and analyzed via the YESDAS Manager software running on a user-supplied Windows 9x/NT PC. This system is a reliable and well tested remote data acquisition and display platform that even provides web access to the data. Calibration information is applied to the data in a foolproof and flexible architecture yet permits users to reconstruct data streams when instruments are recalibrated. Multiple systems can be automatically polled and the data provided on the web letting users efficiently manage networks with many field sites. The UVMFR-7 instrument is easy to install; it needs a user-provided level mounting platform approximately 17" in diameter. Set the latitude adjustment on the shadowband motor assembly (this is usually done at the factory). Place the Detector Assembly on a flat stable platform. Orient the instrument with the shadowband support post toward geographic north in the Northern hemisphere (south in the southern). Step-by-step instructions for this procedure are in the instrument manual. You need to perform this orientation procedure only once, at the time of installation; no further orientation adjustments are necessary. The UVMFR-7 detector assembly is fabricated from anodized aluminum and stainless steel; all hardware is stainless steel and all connectors are potted and weatherproof. The system electronics (including the DC power supply, data acquisition board and ancillary electronics is housed in a NEMA-4X enclosure. The DC power supply is high quality a medical-grade, linear type, with a dual bobbin transformer for maximum power line transient signal and noise rejection. A 3m null modem cable is provided for direct connection with a local PC or laptop. A telephone line connection terminal with spark gap lightning arrestor is provided for connecting a user-supplied Hayes-compatible modem to the system. Screw terminal connections are provided for the 16 auxiliary sensor connections. Use the three leveling screws and the precision bubble level to position the instrument with the receiver surface in the horizontal plane. Once you have completed this step, secure the instrument to your mounting platform via a #10 screw through-hole located in the center of the base. Connect the two cables from the system electronics enclosure to the mating receptacles on the Detector Assembly. Connect the DC standby battery and apply AC power. Depending on whether the system will be local or remote, either connect the serial cable to the PC running YESDAS Manager or connect a modem to the system serial port. The instrument is now installed and ready to take data. You will need to provide a deep cycle marine/RV 12 Vdc standby battery, as well as 115/230 Vac 50/60 Hz power to the instrument. A 2m power cord is provided (please specify 115 or 230 Vac when ordering the instrument.) The entire system can also optionally be configured to operate from a 12 Vdc solar panel/battery system. You must also furnish a ground rod to ensure a static discharge path independent from the path through the power grounding system to help protect against lightning. diffuser to remove aerosols and other particulates. The action of the shadowband coupled with the internal heater help to reduce bird landings and snow and ice build up. UVMFR-7 heads can be swapped without shipping the entire system back to the factory. Alternatively, the instrument can be calibrated against a co-located research grade UV-B spectroradiometer such as a YES Model UVRSS-1024. Calibration should be performed at least every 12 months. Historically, optical thin film interference filter-based instruments have gained a reputation for relatively poor long-term stability, especially in the UV-B region. Some manufacturers have responded by using wideband channels (e.g. 280-305 nm bandpass) that produce data that cannot be separated into the constituent wavelengths. The UVMFR-7 reverses this trend by offering narrow band channels deep into the UV-B region at 317, 311, 305 and 300 nm. Nevertheless, rigid quality control standards are necessary during the filter fabrication steps as well as strict handling precautions during the final assembly process. For long life, environmental thermal stabilization is necessary. Earlier filter-photometer instruments often did not provide adequate thermal stabilization or humidity protection for their filters. Recently, advances in interference filter technology have resulted in next-generation coatings that make them much more mechanically durable and resistant to changes in throughput due to solarization. The UVMFR-7 uses these s-called Ion-Assisted Deposition filters, as well as a diffuser fore optic to reduce the flux level the filters are exposed to by an order of magnitude. This diffuser design, similar to that used in the MFR instrument has demonstrated greatly improved calibration stability over earlier instruments. The UVMFR-7 is part of the MFR family of solar radiation instrumentation that includes the Model SDR-1, MFR-7 and RSS-1024. The UVMFR-4 is a four channel version of the UVMFR-7 that contains only the UV-B channels at slightly reduced cost. For applications requiring visible spectral irradiance, the Model MFR-7 instrument has a broadband channel plus six 10 nm wide (FWHM) visible channels extending from 415 to 940 nm. The broadband channel measures the global, diffuse, and direct-normal components of total solar radiation making it equivalent to a total solar pyranometer and a solar tracker-mounted normal incidence pyrheliometer. A full suite of UVMFR-7, MFR-7 and UVB-1 instruments forms the backbone of several national monitoring networks. The UVMFR-7's data acquisition and control system can also be purchased separately. A YESDAS-2 system collects and store data from up to 32 meteorological sensors while giving the user total flexibility in controlling the data acquisition. For more information, refer to the YESDAS-2 and YESDAS Manager data sheets. The visible Multi-Filter Rotating Shadowband Radiometer was initially developed for the U.S. Department of Energy (DOE) Atmospheric Radiation Measurement (ARM) program by researchers at the State University of New York at Albany and the Battelle Memorial Institute at DOE's PNNL. It was designed as a rugged field instrument to perform the required spectral measurements of solar irradiance components and to serve as the primary data logging station for a suite of associated meteorological sensors. In 1993, YES was granted an exclusive worldwide license by the State University of New York at Albany to manufacture the UVMFR-7 instrument. UVMFR-7: 300, 305.5, 311.4, 317.6, 325.4, 332.4, 368 nm, (2nm FWHM). 2-3%, with angle corrections applied. Center bolt hold-down, compatible with all MFR mounts. A level and stable 40 cm x 40 cm platform is required for mounting.